She was a mere child at the time. Her memories of the war are little more than a mosaic of disjointed pictures of living in trenches, of fighter planes shooting overhead, of running from one spot to another, searching for a sliver of security. She remembers her father getting ready to step out of the house that day; but instead, he was taken away by some uniformed men: Pakistanis. It was wartime after all, and this would have happened eventually, since her family supported and assisted the guerrillas. So what if they lend them a hand discreetly? There was a traitor, a razakar, to pass on information to the enemies. She remembers: her mother went as far as to fall to her knees and beg for her husband's life, only to be kicked away harshly by the traitor; her uncle went to the Paks who took her father away to see if he could help free his cousin, only to be carried away in a train and shot dead. Her father was also scheduled to face death in the same manner, but he was miraculously saved. But perhaps 'ironically' would have been a more suitable word, because her father's saviour was a Pakistani. Not an enemy, but a friend. Sitting here, after nearly four decades have passed, comfortably ensconced in the warmth of my home, I find it difficult to organise my recollections of the War of Independence. Each time I open that compartment of my mind, the sights and sounds tumble out unchecked. This brings up one of the images that have forever been embedded in my mind. It is the image of a dark green, gleaming fighter plane, flying low above our heads, spraying the ground with bullets. I remember being rooted to the spot, staring up at this grim bearer of death and destruction. I could see the glint of the spent shells as they spewed from the machine guns. I remember the sounds, the deafening sound of the aircraft; the staccato bark of the guns and the heart-stopping thunder of the anti-aircraft guns. I was nine years old at the time. Because of my bad eyesight, I had led a very sheltered life. As a result, I had no idea of the overall political turmoil, and only saw the War from the eyes of a pampered child. With most of Bangabandhu's associates either killed or arrested after 25th March, it was clear that my father was in grave danger. His friends urged him to flee, but he stayed back. And then, one night, the inevitable happened. It was the 7th or 8th of April, 1971. I will forever remember this night as the most terrifying night of my life. At around 8 or 9 o'clock in the evening, a few army jeeps pulled up in our compound. Within minutes, they surrounded the whole house. My father told my mother to take us and sneak out the back way, while he answered the front door. Our attempt was futile, as the house was surrounded. The soldiers searched the whole house, and, of course, we were discovered. Luckily for us, their leader seemed to be a decent man. He addressed my mother as "baheen" (sister) and told her not to worry. He told her that my father would be returned in a short while. That "short while" turned out to be over eight months, when he was finally released on December 17, 1971. During the latter part of the War, sometime in October, we came back to our house from our grandparents where our mother had taken us for safety. We occupied one large room in the ground floor, which was deemed to be fairly safe from air bombings. We stuck thick brown paper on all the glass windowpanes to block out any telltale signs of light from our house. At night, we did not turn on the lights, and only used flashlights and candles. At the first sound of air raid sirens, we would blow out all the candles, and sit there in the dark, huddled together, silently saying our prayers. By the second week of December, we knew that victory was in sight. People started holding their heads up high, raising their voices and hailing each other with "Joi Bangla". And then came that day. December 16, 1971. Finally it was here - the moment of victory was here! The moment that justified all the humiliation, the terrible suffering and all the bloodshed. Like everyone else, I too burst into a frenzy of rejoicing. The heady sense of jubilation and well-being made me giddy. Even the day seemed to be bright and shining like a new penny. Oh what a feeling! I would gladly give up thirty years of my life to re-live that day! But in the back of my mind, one thing was missing. My father was not home yet, and things did not seem complete without him. My father finally came home the next day. At around 11 o'clock in the morning, he got down from a rickshaw and called out our names. As far as I can remember, it was a Friday. At the sound of his voice, we flew down the stairs, shouting at the top of our voices. I had this warm glowing feeling of complete and utter contentment. When finally our family was together I felt strong. I felt like a hero. I felt like I was ten feet tall. It was cold, dark and damp, but that was a good thing for the Bangladeshi Muktijoddhas, because most of them had been raised in villages. For a Pakistani soldier, this weather was treacherous. The entire mission had depended on the rain. The Pakistani outpost was in perfect position to watch for any attacks, so the Muktijoddha bahini was hoping the downpour would help mask them. The small squadron of eight men gathered at the village mosque and finished going over the details of the attack. They snuck up as close as they dared and dropped down to crawl the rest of the way. They had five grenades and ample ammunition. Unfortunately, there were only seven guns for eight men. They captured the two sentries unawares in the dark, and to avoid loud gunshot, one of the Muktijoddhas used his knife to silence them. The rest of it was simple. The army was asleep when the grenades burst. The loss was that one Muktijoddha, who was shot down by a Pakistani soldier as the men ran from the blast. The soldier survived because he had been outside the camp, presumably taking care of natural business. Within the month, all five grenades were gone, along with five camps of Pakistani soldiers. The Muktijoddhas were moved on to the next village, save one, who decided to 'abandon' their cause to stay behind with his family. 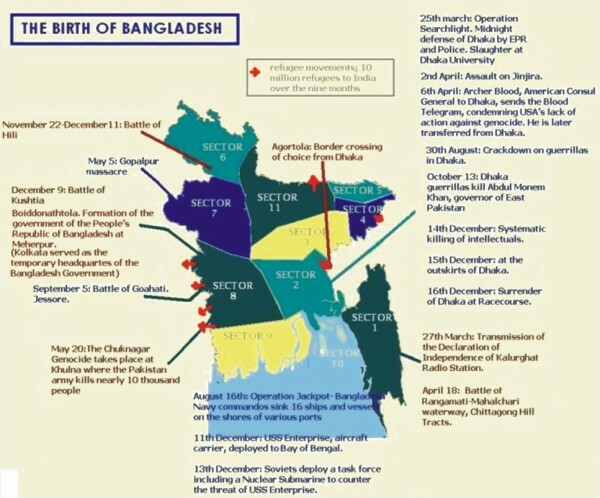 With only six people left, they moved to the next attack zone, from Ishwardi to Dhaka city. They were separated and placed under different commands. Only one of the seven survived the war. He says it's only because the group of missions described was the most dangerous of all those he'd been on. Of the remaining five, three had died in a shootout between the Muktijoddhas and the army, and one had been captured and killed. The final Muktijoddha went missing and was never found.